Remarkable progress has been made in cancer medicine during the last two decades. 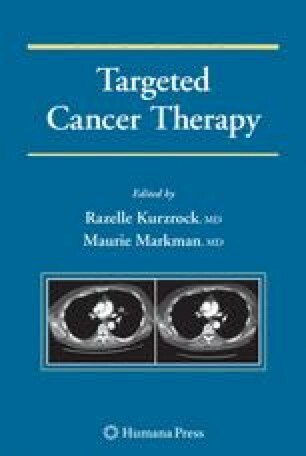 The number of anticancer agents entering clinical trials has grown exponentially; and patients with diseases such as acute promyelocytic leukemia, chronic myelogenous leukemia, chronic lymphocytic leukemia, multiple myeloma, cutaneous T-cell lymphoma, colorectal cancer, breast cancer, GISTs, and renal cell carcinoma have already received some of the benefits from molecularly tailored strategies. Despite sustained progress, however, many patients have not yet benefited from this sophisticated approach, and cancer remains among the three most common causes of death worldwide. Carcinogenesis involves the accumulation of multiple molecular mutations responsible for deregulation of critical signaling pathways that control vital cellular functions. Targeting molecular structures on cancer cells is highly specific and can modulate vital functions such as cell growth, migration, differentiation, and survival. Targeted therapies are generally well tolerated, and the overall supportive treatments now available for cancer patients are better than in the past. Nonetheless, several challenges associated with anticancer agents, molecular targets, tumor assessment tools, clinical trial designs; and the drug development and approval process exist. Overcoming these challenges is critical to improve the early success achieved during the past two decades. It also is important to consider that the sophistication of this approach has extraordinarily increased the costs of drug development and patient care, making the application of these novel agents a privilege accorded to a small population of patients throughout the world. Some of these challenges and strategies for addressing them are summarized and discussed in this chapter.